1. Preheat the oven to 200˚C, gas mark 6. Toss the apples and pears with the sugar, lemon juice and a pinch of salt. Stir through the blackberries, then scatter in an ovenproof dish (approximately 1 litre in volume) or individual ramekins. 2. 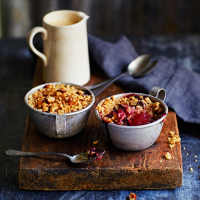 For the crumble, mix the flour, oats, sugar and a pinch of salt in a separate bowl. Using your fingers, rub in the butter until the mixture resembles breadcrumbs with a few bigger chunks. Stir through the nuts and vanilla powder (if using). 3. Flatten out the fruit as much as possible using the back of a spoon, then scatter the crumble on top. Sprinkle over the demerara sugar and bake until golden – 40 minutes for a large crumble or 25-30 minutes if using ramekins. 4. Allow to cool for at least 10 minutes before serving, with lashings of double cream, ice cream or custard, if liked.